Thank you for the kind get-well wishes and emails. I appreciated them a lot. Mercifully, the illness that swept in so quickly, leaving me flat on the couch for three days, left just as swiftly as it arrived. I suffered mostly a numbing fatigue and head congestion, lacking energy to do much of anything except stare out the window. And read. I blame my current thought process on the book at hand, ‘ A Slice of Life- Contemporary Writers on Food’ that has followed me around lately. It was an ‘A-HA’ find at Half Price Books- oh, probably back in the Fall, before holiday stuff, before the chill of Winter set in, before the lethargy that inevitably follows Christmas and New Years. It got dropped into a magazine rack and forgotten. When I pulled it out it was covered in dust. So well I treat my belongings. But then I opened it and got swept away. It all started to make sense to me with just a few pages, this nagging sense of why, and how. Why do we constantly search for the perfect meal, the best ingredient, the finest eating experience? How do we achieve it, and better yet, maintain and hold on to it? And what exactly are we looking for anyway? 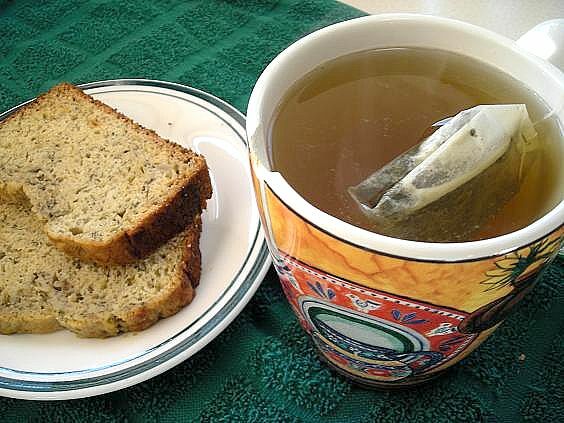 Outside of the pages of that book, I began to find my answer in a slice of this tea bread and the comfort of a favored, but cracked tea cup. So it’s no secret to me that when I bake I feel like I am channeling my mother’s spirit, the one that would wake at dawn in the summer to bake cookies before the sun burned the air crisp and dry; this is simple for my mind to deduct, but there has always been something else that nags at me, and with the first bite of anything I make, I take from it several things. One- it’s comfort in the true sense of the word. Nothing touches us deeper than homebaked something, anything. We can eat a store-bought chocolate chip cookie, or nibble on a slice of bread from a plastic bag, but it really doesn’t touch us. It doesn’t soothe. The second has always been far more elusive, and less attainable and finally I know what it is. It’s the taste of home, and I think for most of us, it’s the one missing element in everything we cook. This is not to say that we can’t find comfort in the foods we eat, the meals we prepare for others, but what is it, with Christmas still within a memory’s grasp, that makes us want to recreate ‘the meals we used to know’? Why is it so important for people to sit down- let’s say at holiday time- to a meal of familiar foods, the same tastes and textures we grew up with? Isn’t anyone interested in something new? No. We’re interested in being home. In each bite, each dish we make or cookie baked or cake decorated, aren’t we just a wee bit eager to find that one spot in us that tells us, without a doubt, that we’re home again? Isn’t it why we search high and low for the perfect cookie recipe, try a dozen methods of roasting chicken, bake loaf after loaf of banana bread in a futile search for a missing ingredient that we’re never going to find? This is why home-cooking has become such an explosive and highly demanded part of our lives, why we gather at the table with eager eyes; it isn’t so much the food, it’s what the food can bring to us that nothing else can. Take that banana bread, the reason for this post. My mother made banana bread all the time. I can picture our kitchen- it was small and so very dated- dulled yellow walls and a deeply blue and green carpet- carpet! in the kitchen!- the dishwasher we had to attach to the faucet, the jar of bacon grease on the stove. I can recall leaning on the counter, the southern window at my back, nibbling away at a slice of her banana bread, a small pile of unwanted walnuts growing on the counter next to my elbow. I loved her banana bread; she purposefully would buy too many bananas so that she could make it. It was perfectly flecked with banana, it smelled wonderful and she beamed with every loaf. I even have her recipe, yellowed as those walls, frail and old, crinkling at the edges. But I make the loaves and it doesn’t taste the same. I’m at my own kitchen counter with the bright southern light, my dishwasher tucked under the counter, no bacon grease in sight. But the recipe is the same and shouldn’t it taste like I remember? It never does. Something is always missing. It’s not the essence of those despised walnuts, or the scene out the window of my youth. It isn’t a method of her own that I never learned. It’s her kitchen; it’s her warmth and love, the very scent of home. We can have our own places we call home, and they feel that way to us the moment we step in the door. We turn out the lights and know, by heart and finger touch, just how to walk through the rooms. But what we make in our own kitchens, even with a treasured recipe, never seems to taste exactly like we remember. An old friend once extolled the merits of the Italian foods she ate while working on that continent, and her extreme disappointment, upon opening a small bottle of olive oil that she brought home, a favored flavor while “on the boot” to find that, in her words “It tasted just like any old olive oil. It wasn’t anything like I remembered.” Of course not. She wasn’t in Italy. The banana bread is the same thing; it’s the exact same recipe I ate when I was young, but I’m eating it on another continent, a figurative place that’s a whole lifetime away from what I remember. 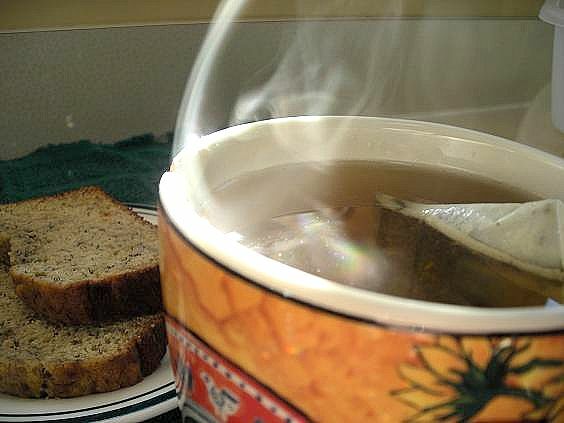 It’s the tea cup in our lives, with the crack that makes it imperfect, one we can’t throw out. Preheat oven to 350 F. Place bananas in a large bowl and mash with fork. Stir in sugar and let stand for 15 minutes. Add applesauce, vanilla and eggs, mix well. Stir dry ingredients together, add to banana mix and blend only until incorporated. Pour into standard loaf pan coated with nonstick cooking spray. Bake for 45 minutes, or until a wooden toothpick inserted in the center of the loaf comes out clean. Remove from oven and let stand 10 minutes before removing from pan. Cool on wire rack. For the Chicken Curry recipe, the only one I use, go HERE. Aaaaaaand I’m back! Miss me? I did treat you to a few posts, shelved prior to ‘the week without tastebuds’ in my house so I wasn’t superbly absent. Interestingly enough, while I recuperated, my blog was inundated with hits, mostly searching for pictures of funny cats. I suppose I’m not so remiss in that area, but this is a food blog! So it’s December, and the month of Christmas, which means it’s time to bake cookies. Baking for me is highly nostalgic; my mother was a champion baker, if only just for our family. She prided herself on never having store-bought cookies, cakes or anything like that in our home, she baked, and she baked really darn well. If she had one prominent love language to show us, it was in her Baking. She only had to call out “Who wants to help me make cookies?” and I would often drop everything I was doing and race to the kitchen. It was our time to bond, hang out and laugh, not to mention, nibble on warm cookies. Each recipe I have of hers brings me waves of nostalgia whenever I make them- Gingersnaps, Peanut Butter Fingers, Coffee Toffee Bars, Three Layer Bars; they all spelled L-O-V-E in our house. I love to bake but don’t have the benefit of five kids to take away the tempting treats, so I don’t do it too often unless it’s for a crowd, or a special occasion. One of Griffin’s favorites is what our family, and likely plenty of others, always calls ‘Church Window Cookies’. 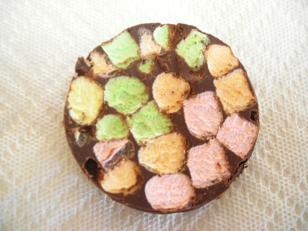 It’s a simple chocolate and colored mini-marshmallow cookie, that when cut (and if you squint and engage enough imagination), can resemble stained glass. Melt one stick of butter and one bag of chocolate chips of your choice, stir gently until smooth, then cool. Pour over one bag of colored mini marshmallows, stir to combine. Either roll into logs, or scoop into plastic drink cups, chill until firm, then slice. Combine dates, sugar and 1 teaspoon vanilla, and hot water in a medium saucepan. Cook over medium heat until thickened – about 6 – 8 minutes. Stir constantly. Remove from heat and stir in pecans. Set date mixture aside to cool. Combine brown sugar and butter. Cream until light and fluffy. Beat in eggs. Combine flour, soda, cream of tartar, salt and cinnamon. Stir into creamed mixture. Add 1 teaspoon vanilla and mix well. Divide dough into thirds. Roll each portion into a 12″ square on waxed paper. Spread with 1/3 of date mixture. Lifting up edge of waxed paper, gently peel off dough and roll jelly roll fashion. Wrap rolls in waxed paper and refrigerate overnight. Cut dough into 1/4″ slices and place two inches apart on greased cookie sheet. Bake at 350 degrees for 8 – 10 minutes. Cool cookies on wire rack. Cream together butter and cream cheese until light and fluffy. Gradually add sugar and beat hard. Stir in vanilla, lemon juice, and lemon zest. Add flour, mixing well. Stir in nuts. Push small amount from spoon onto a greased baking sheet. Bake at 300 degrees for 20-25 minutes or until delicate brown. While hot, roll in powdered sugar. 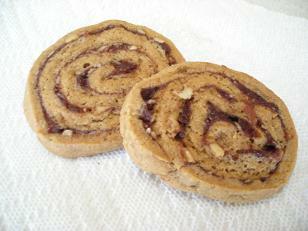 On the Date-Nut Pinwheels, I doubled the filling mixture, using half dates and half dried sweet cherries. This mixture took a lot longer than 6-8 minutes to thicken, likely from the extra bulk. Cook until it resembles a thick paste, almost jam-like, and allow it too cool completely. I also subbed in some wheat flour, and used a little extra cinnamon. The dough was tacky, I treated it somewhat like pie dough, tossing a little flour over it to keep the rolling pin from sticking. Chill the logs thoroughly and keep them chilled while baking. Any extra filling is wonderful spread on toast. In our version of the Window cookies, we used Ghiradhelli dark chocolate pieces. If you’re going to eat chocolate, why not make it dark?? Don’t sub the fake stuff for butter; trust me, it tastes so much better to use the real thing. We keep these chilled for a better texture. Cool down the chocolate mix before pouring over the marshmallows or they will melt. Using plastic drink cups is super easy; make sure to press the mixture well into the cup for the best effect. When chilled, cut a slit in the side of the cup and break it apart, pushing the solids onto a cutting board. Use a serrated knife and just a little pressure to slice. *Hint* The bottom slice from the cup is the best part! For the Cheesecake cookies, I added in about 3/4 of a teaspoon of pure lemon extract to give the cookies more pizazz. It’s been my experience with using just zest and juice that it needs a little added something to really make that lemon flavor shine. Instead of adding in the nuts to the batter, I dipped the cookies into the nuts prior to baking, then finished them with a glaze made of lemon juice and powdered sugar.